The Vancouver Sun Children's Fund hasn't added a story. Within the past few months this newspaper has carried stories concerning poverty that should cause alarm in the minds of most right thinking people. One disclosed that hundreds of homeless children can be found in the Greater Vancouver area -- 681 according to a survey. Another spoke of the continuing delay by a B.C. government to formulate a poverty reduction plan in a province that has the highest rates of child poverty in the country. Yet another spoke of the insidious effect poverty was having on the mental health of children. B.C. is the only province without a poverty reduction plan despite the fact that 557,000 residents -- including a fifth of our children -- are living in conditions so abject as to endanger them physically, mentally and morally. The NDP government came to power promising to improve the lives of the poor but we won’t know until next year what their plan entails although its aim, apparently, is a drastic reduction of poverty levels by 2024. Now that must seem a long way off when today you don’t have enough money to eat and pay the rent or can’t buy your child a pair of shoes or a winter coat. So until this brave new world arrives when, hopefully, thousands of children aren’t coming to school hungry, or traumatized by the dehumanizing stresses of living in destitution this newspaper will continue its efforts to help them through our Adopt-A-School (AAS) campaign. It will also continue to demand that the government implement a program to ensure children who need feeding at school get fed. AAS was launched in 2011 and this will be our eighth appeal. 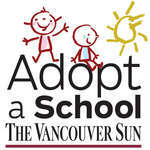 “To date $3.8 million has been distributed to 140 schools throughout the province,” said Harold Munro, editor of the Vancouver Sun-Province newspapers and chair of The Vancouver Sun Children’s Fund board which oversees Adopt-A-School. “Last year almost $600,000 was sent to schools to help alleviate the effects poverty was having on students -- buying food, clothing, and other necessities. The money was distributed to teachers who have to deal with the stress of seeing children in pitiful states without any other means of help,” he said. This fall the Sun has received requests from close to 80 schools totalling more than $800,000 -- most asking for help to feed children. In September The New York Times carried a front page story about children in a wealthy, first world country arriving at school unfed, hungry and chronically in need of help. That a prestigious North American newspaper found such a story worth the telling is significant. The story -- with a few geographical alterations -- could well have fitted into the pages of this newspaper’s AAS coverage anytime in the last seven years. Their reporter went to Morecambe -- a small seaside town in the northwest of England. Teachers there said that until recently they had never seen children arriving in such a state. What shocked them most was that many were children whose parents had jobs who in the past could be expected to feed them. The conditions the NYT found in Morecambe can be found here. However, there are some differences between Morecambe and Vancouver. Firstly, we have had this state of affairs far longer than four or five years and the level of privation in our children is much worse. Unlike humble Morecambe, the working poor here have the added burden of living in one of the world’s most heated real estate markets which has driven rents to a point where -- for the poor -- it becomes a toss up between paying rent or eating. Teachers have consistently pointed to that dilemma as one of the main evils suffered by families trying to exist on income assistance or minimum wage jobs. It results in families constantly going hungry at weekends, some with no food or, as we discovered in one case, with only an onion to share between them. It is the reason The Vancouver Sun is again asking readers for their continued support, said Munro. “There are scores of requests from schools desperate to give these children and families the dignity of being fed, clothed and cherished,” said Munro. “This is not an appeal for charity as it is for justice. These children are voiceless, they suffer the indignity of hunger and privation in silence and their pain is only apparent to their teachers. “We can’t leave it like that,’ said Munro. An idea of what some teachers here are dealing with is apparent from an email recently received from an inner-city school teacher ostensibly describing how donations of clothing -- thanks to AAS -- were coming into her school. The Vancouver Sun Children's Fund hasn't posted any updates yet.